The Cornfield–The Last Vast Green Space in the Heart of L.A. There are unfair school, park, and health disparities in Los Angeles. The shared use of parks and schools can alleviate the lack of places to play and recreate, while making optimal use of scarce land and public resources. Unfortunately, only 103 out of 605 LAUSD schools have five acres of more of playing fields, and those tend to be located in areas that are disproportionately white and wealthy and have greater access to parks. LAUSD provides 71% more play acres for non-Hispanic white students than for Latino students in elementary schools. There were only 30 joint use agreements between LAUSD and the City of Los Angeles Recreation and Parks Department as of April 2006. The health implications of the lack of places to play in parks and schools are profound. In California, 73% of fifth, seventh, and ninth graders did not achieve minimum physical fitness standards in 2004. In LAUSD, 87% of students were not physically fit. Yet in 2006, 51% of school districts in California, including LAUSD, did not enforce statutory physical education requirements. At LAUSD’s South Gate High School, 1,600 children took the state Fitnessgram test and not one passed. Forty schools did not have a single physically fit student. Less than 10% of students were physically fit in nearly one-third of the 605 schools in LAUSD. Only eight schools had student populations that are more than 50% physically fit. The City Project is helping students move more, eat well, stay healthy, and do their best in school and in life. Our Policy Report Healthy Parks, Schools, and Communities: Mapping Green Access and Equity for the Los Angeles Region provides ten equal justice principles for healthy, livable schools, parks, and communities for all. the campaign to Free the Beach! and Free Malibu! City Controller Laura Chick recently published three audits that document systemic management failures in the Los Angeles Department of Recreation and Parks, and more importantly, provide a blueprint for reform. The Controller’s major findings and recommendations highlight the need for: a strategic plan to improve park services in every neighborhood, and eliminate or mitigate inequities in parks and recreation; standards to measure equity and progress in achieving reform; a fair system of park financing and recreation fees; a community needs assessment now and every five years; improved park safety; and shared use of parks and schools to make optimal use of scarce land and public resources. The audits cover finances, recreation programs, and maintenance. The City Project is organizing support to improve park and recreation programs for all the children of Los Angeles and their families and friends through, among other means, implementation of the recommendations in the audits. Cornfield photo taken by Robbie Labelle. area does not have a single blade of grass. In 1999, the City of Los Angeles and wealthy developers proposed building 32 acres of warehouses on the Cornfield. The City Project helped bring together a diverse alliance of over 35 community, civil rights, environmental, business, and civic organizations and leaders to stop the warehouses and convince the state to purchase the site for a park. Secretary of Housing and Urban Development Andrew Cuomo withheld federal funds for the proposed warehouse project unless there was a full environmental impact statement, including an analysis of environmental justice concerns under Title VI of the Civil Rights Act of 1964, its regulations, and other federal laws. Read the 2000 letter from Secretary Cuomo here. Read the Administrative Complaint here. The abandoned rail yard could have been warehouses. Instead, it’s a park. “On a deserted railroad yard north of Chinatown, one of Los Angeles’ most powerful and tenacious real estate developers, Ed Roski, Jr., met his match,” as reported in a front page article in the Los Angeles Times. “Robert Garcia . . . organized a civil rights challenge that claimed the project was the result of discriminatory land-use policies that had long deprived minority neighborhoods of parks.” Jesus Sanchez, L.A.’s Cornfield Row: How Activists Prevailed, L.A. Times, April 17, 2001. The Los Angeles Times Magazine called the community victory “a heroic monument” and “a symbol of hope.” James Ricci, A Park with No Name (Yet) but Plenty of History, L.A. Times Magazine, July 15, 2001. The City Project advocates for public art at the Park that will reflect this vision and the values at stake – giving children safe and healthy places to play, improving recreation and health, equal access to public resources, democratic participation in deciding the future of the community and the Park, creating local jobs and economic vitality, and providing the clean air, water, and ground benefits of urban parks. cultural and historic resources in the birthplace of Los Angeles. park will feature soccer fields, a running track, and other sports. area, bike paths, and an amphitheater. now have more space to play soccer and spend time with their families. through the Heritage Parkscape in the heart of Los Angeles. and passive recreation in Taylor Yard and the Cornfield. The City Project is working with the Baldwin Hills Conservancy, Community Health Councils, and local leaders to study the impact of oil drilling on the Baldwin Hills community and park. The County of Los Angeles has imposed a one year moratorium on any new oil drilling to prepare a full environmental impact report and community standards district (zoning) to regulate the impact of pollution, noise, and vibrations from oil drilling on health, parks and recreation, homes, schools, businesses, clean air, clean water, and climate justice. space for recreation, conservation, education, and economic vitality. Read the Culver City News coverage of the oil drilling and environmental summit in the Baldwin Hills. Review (CPR) to eliminate the Conservancy and its state funding. in which they live while influencing the prosperity of their communities. In response to community demands led by The City Project, Concerned Citizens of South Central Los Angeles, California Pan Ethnic Health Network (CPEHN), and PolicyLink, as well as hard hitting coverage in the Los Angeles Times, the city of Los Angeles held a ground breaking – again – for the Ascot Hills Park in East Los Angeles on June 14, 2010 – four years after the city held the ground breaking for the same Ascot Hills Park in East L.A. in November 2005, but failed to open the park. “[I]n East L.A. itself, the largest open space is Evergreen Cemetery, which basically sends a message to kids: ‘If you want open space, you have to die first,’ The City Project’s Robert García told the Los Angeles Times in 2004, when the community proposed the park. Miguel Bustillo, Former Foes Unite Behind a Proposal to Turn Old Reservoir Site into a Park, L.A. Times, Jan. 15, 2004. According to a Los Angeles Times Editorial in November 2005, “downtown and Eastside residents could be hiking and watching the setting sun backlight downtown’s skyscrapers from Ascot Hills by the end of next year” — that is to say, by the end of 2005. L.A. Times Editorial, A Diamond in the Rough, Jan. 17, 2004. Why the four year delay in opening Ascot Hills Park? 11. Any reason why open, green space in Ascot Hills is gated and locked to the public with No Trespassing signs posted. 12. Any reason why the public cannot use the open, green space in Ascot Hills that is gated and locked. 13. Any comments from the public or public officials regarding the operation of Ascot Hills park as a passive park, which would require little maintenance. 14. Any reason why Ascot Hills, or parts of Ascot Hills, cannot operate as a passive park now? The City Project and Mountains Conservation and Recreation (MRCA) have offered to take over the project and open the park faster than the city will. Now the city claims that the park will celebrate its “grand opening early next year.” The City Project working with the community will serve as a watch dog to make sure the city this time keeps its promises to the children of East L.A. and their families and friends. 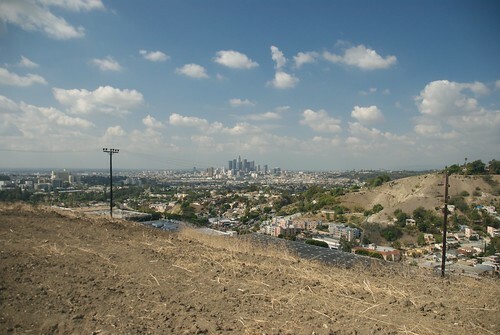 “The effort was a great example of what can be accomplished when the community and elected officials work toward a common goal — in this case, preserving green, open space for the public to enjoy,” said Villaraigosa, wearing a white hard hat and clutching a shovel to turn the first spadeful of dirt at Ascot Hills Park. Today, the property tucked in the working-class communities of Lincoln Heights and Hillside Village stands as an emblem of what has not been accomplished. Scant areas of the 140-acre park are open to the public. Its most panoramic hilltops and largest patches of remnant native plants remain locked up behind “no trespassing” signs. The park was scheduled to be completed by June 2007, according to an analysis of park documents conducted by the City Project, a nonprofit organization dedicated to creating more public open space. “Instead, we have padlocks, no trespassing signs and broken promises — and no good explanation for it,” said attorney Robert Garcia, executive director of the City Project, which has begun the process to file a suit against the city. Read the rest of the article by Louis Sahagun, City Years Behind Finishing Ascot Hills Park in East L.A., in the Los Angeles Times, Jan. 2, 2010, here: www.cityprojectca.org/blog/archives/3146. Click on the image above for more pictures of Ascot Hills. Mayor Antonio Villaraigosa issued the following press release in 2005.
park and open space on LA’s Eastside. for children, as well as open grass areas with trees. campaign that sent thousands of letters to Governor Schwarzenegger. various proposals to develop the area for other uses. further lobby for the funding. That is the end of the Mayor’s press release. Private firms have filed a complaint to preserve public access to the trails in historic Millard Canyon that begins in the Angeles National Forest and ends at the Arroyo Seco in Altadena. Property owners in the gated La Viña enclave have sought to cut off public access to the trails by posting “No Trespassing” signs and harassing hikers and equestrians. The suit names La Viña Homeowners Association, the County of Los Angeles, and the Santa Monica Mountains Conservancy as defendants. Recently, the public won a victory when the court ruled that the case may proceed to trial, throwing out the property owners’ objections. The trails have been used by the public for millennia, beginning with the Native Americans who traveled seasonally through the canyon from the mountains to the plains along the Arroyo Seco and the Los Angeles River. In the 1820s, Millard Canyon was known as Church Canyon because the lumber to build La Placita Catholic Church was brought from the canyon to the original Pueblo de Los Angeles, the birth place of the City. La Placita (now also known as Our Lady Queen of Angels Church) was the first church built in Los Angeles and is now in El Pueblo Historic Monument. Robert Owens, a slave who bought his freedom and moved to Millard Canyon around 1850, used local trails to get firewood and building materials down to the U.S. Army post near the Los Angeles harbor. Owen Brown, son of abolitionist John Brown, moved to Altadena after surviving his father’s raid on a government arsenal at Harper’s Ferry in Virginia in 1859. Owen Brown was buried on a peak overlooking Millard Canyon. Plaintiffs Marietta Kruells and Karina Macias are members of the public and taxpaying residents of the County concerned with the obstruction of their right to access, use and travel on the open space and trails. The suit seeks to keep the trails open for all, and to preserve the rich historical and cultural legacy of Millard Canyon and the beauty of the site. Los Angeles is park poor. The trails are needed for hiking and horse back riding, to improve human health through recreation, to promote spiritual and environmental values of stewardship of the earth, and for equal access to public resources, whether or not one can afford to live in a secluded gated enclave. Plaintiff Save the Altadena Trails filed a similar suit on July 19, 2005, represented by the law firm of Monroe & Zinder. The County of Los Angeles also filed a suit on July 21, 2005. The effort to preserve access to historic Millard Canyon has been covered by the Los Angeles Times and the Pasadena Star-News. of the most precious natural resources in Southern California. must remain open for all. public opposition, we stopped construction of the Canyonback Gate – temporarily. Impact Report (“EIR”), but the EIR ignores the issue. and how to maintain public access. at risk in the canyon below. written a few miles away in East Los Angeles. What they got instead was a 14-acre vacant lot. The link between these two sites is Robert Garcia of [The City Project at] the Center for Law in the Public Interest. The center represented Concerned Citizens of South Central LA to stop the incinerator in the mid-’80’s and has been a driving force behind the new East Los Angeles park, Ascot Hills. won a federal consent decree against the Metropolitan Transit Authority. He received a call from Mayor Richard Riordan. to argue for parks as well. rail yard east of Chinatown in 1999.
suggest to the city the development of a park on the parcel. pressure came through the formation of the Chinatown Alliance. But Delvak negotiated with the Center for Law in the Public Interest and came up with an agreement that if the center could find funding to buy the land for a park, Majestic would pull out. If it could not find funding, the center would withdraw its opposition to the development. this as a vindication of his strategy. The Center for Law in the Public Interest has used a similar legal rationale and strategy to secure the Taylor yards (adjacent to the Cornfields) and land in Baldwin Hills for open space. to the leveling Riordan proposed to create soccer fields. could make it happen. It didn’t require a lawsuit or a legal complaint. Villaraigosa exhibited leadership,” Garcia said. restore native vegetation and maintain a park ranger at Ascot Hills. the evolution of his legal and political strategy. Larry Kaplan, the L.A. area director for the Trust for Public Land, commends Garcia and the Center for Law in the Public Interest for their successes but thinks there need to be alternate strategies. “If you are not able to get open space through regulation or litigation, then buy it.” The Trust for Public Land has basically worked as a real estate organization to buy open space with public and private money and transfer it to park districts or private land trusts. has grown as part of the Urban Park Movement. In the last 10 years the Trust for Public Land has helped secure open space in the Ballona wetlands, in areas along the Los Angeles River northeast of downtown and in the city of Maywood, in Watts near Jordan Downs and in the Cornfields, following Majestic’s dispute with the Center for Law in the Public Interest. outside of the bureaucracy,” she said. is open to open-space proposals. Mayor Villaraigosa joins Councilman Ed Reyes and The City Project’s Executive Director Robert García to call for urban park funding. The failure of the negotiations over infrastructure bonds in Sacramento is bad for urban parks, for revitalizing communities, and for the children of California, but the struggle is not over. We can and will continue to build diverse alliances to fight for urban park funds to be distributed fairly among all communities. The Senate infrastructure package that was being negotiated as of March 15, 2006, included about $2 billion for urban park type projects, and $2 billion for wilderness park type projects. We urge the Governor and legislative leadership to put together a similar package for the November 2006 ballot. Statewide environmental groups have also put together a $5.388 billion water bond for the November 2006 ballot that would provide funds that can be used for urban parks, including about $490 million directly for urban park type projects, and another $600 million that can include urban park projects including the greening of the Los Angeles and San Gabriel Rivers. The California Department of Parks and Recreation must prioritize a fair share of its $400 million for urban parks. Another $800 million for flood control purposes can be used for urban park projects. The Sepulveda basin in Los Angeles, for example, is a park and flood control basin. People of color were instrumental in passing Prop 40 in 2002, which included funding for urban parks. They will make a difference again in November 2006. Prop 40 passed with the support of 77% of Black voters, 74% of Latino voters, 60% of Asian voters, and 56% of non-Hispanic White voters. Seventy-five percent of voters with an annual family income below $20,000, and 61% with a high school diploma or less, supported Prop 40 – the highest among any income or education levels. Traditional environmentalists need to work with diverse communities to pass resource bonds for the good of all the people. Regions and cities around the state reflect the need for urban parks, including Oakland and the Bay Area, and Fresno. The Los Angeles region, for example, is park poor, and there are unfair disparities in access to parks and recreation. Children of color living in poverty with no access to cars have the worst access to parks and recreation, as the linked map illustrates (map 201) (941 KB, PDF). Too many people live more than half a mile from the nearest park (map 202) (754 KB, PDF). Children of color disproportionately live in the state assembly districts with the highest levels of child obesity and the worst access to parks and recreation (map 601) (611 KB, PDF). This is the first generation in the history of the country in which children will have a lower life expectancy than their parents if present trends in obesity and other diseases related to inactivity continue. There are unfair disparities in access to parks and recreation by Assembly District and Senate District. Thus, for example, Speaker Fabian Nuñez’s District 46 has only .51 net acres of urban parks per thousand residents, compared to 283 net acres in Senate District 37. Senator Kevin Murray’s District 26 has only 1.18 net acres of urban parks per thousand residents, compared to 160 in Senate District 17. The disparities are even more dramatic if total acres of parks including forests and other large natural open spaces are included, as illustrated by the charts and graphs for State Assembly District and State Senate District. For example, Speaker Nuñez’s District 46 has only .51 total acres of parks per thousand residents, compared to 3,348.72 in District 37 (217A and 220A). According to a survey by the Public Policy Institute of California, 64% of Californians believe that poorer communities have less than their fair share of well-maintained parks and recreational facilities. [Mark Baldasare, Public Policy Institute of California Statewide Survey: Special Survey on Californians and the Environment vi (June 2002)]. State and local school bond funds can be used for the shared use of schools and parks. Schools must be built with playing fields open after school and on weekends. The same children need schools and parks for places to play and engage in physical activity to improve their health and reduce obesity and diabetes. Fully 87% of the children in public schools in the Los Angeles Unified School District are not physically fit. The same taxpayers pay for schools and parks. The shared use of parks and schools can alleviate the lack of places to play and recreate, while making optimal use of scarce land and public resources. This is demonstrated by the map of parks and schools with five acres or more of playing fields (map 502). California faces an historic opportunity to improve the quality of life enjoyed by our residents for generations to come. Strategic infrastructure investments will enhance the economic competitiveness of the state, increase social equity, and improve the environment. Infrastructure plans should be guided by statewide interests, but tailored by region to meet particular needs and priorities. Urban parks, open space and related human health issues are a critical component of any state, regional, and local infrastructure plan for livable, just communities. Urban parks promote the core values at stake in building public infrastructure: providing children the simple joys of playing in the park; improving health and recreation; equal access to public resources; democratic participation in deciding the future of the community; economic vitality for all with increased property values, local jobs, small business contracts, and affordable housing; spiritual values in protecting people and the earth; the environmental benefits of clean air, water, and ground; and sustainable regional planning. The City Project will continue to fight (1) for significant funding for urban parks resulting from any resource or infrastructure bonds as part of a comprehensive plan to promote economic, environmental, and equitable development for all, and (2) to make sure that underserved communities receive their fair share of public benefits. The City Project is working with a diverse and growing urban park network including: Alianza del Rio, Amigos De Los Rios, Anahuak Youth Soccer Association, Asociacion de Fraternidades Guatemaltecas, Association for Environmental and Outdoor Education, Audubon Society, Center for Law in the Public Interest, Coalition for Clean Air, Congreso de Hermandad Centro Americana, Eco Maya, Federaciones de Guanajuato, Federaciones Mexicanas, Highland Park Neighborhood Council, KIPP: LA Prep, Mujeres de la Tierra, National Hispanic Environmental Council, Nature Conservancy, North East Trees, Organización en California de Líderes Campesinas, People for Parks, Salvadorian American National Association, Sierra Club, Socal Grassroots, Trust for Public Land, William C. Velásquez Institute, and Youth Empowered Scholastic Sport Service (YESSS). Check The City Project’s web site and blog regularly for new developments concerning healthy parks, schools, and communities. Write to the Governor, Speaker, Senate President Pro Tempore, and other Conferees letting them know you support urban park funding that reaches underserved communities in any infrastructure bond. A sample letter (38 KB, PDF) with the contact information for office holders is attached. Please send a blind copy to The City Project, or otherwise let us know what action you take.